The Formula 1 Grand Prix gets under way once more on Friday 4th April. As in other recent years, there will be protests opposing the staging of the race in Bahrain, a small country afflicted with a profoundly undemocratic monarchical regime where workers rights to organise are – if they can be said to exist at all – extremely tenuous. In 2011, as the popular rebellions in Egypt and Tunisia became the focus of global media, a less widely reported movement for reform emerged in Bahrain. Calling for substantial steps toward democratisation of political life and respect for human rights, a renewed movement for change arose, centred on mass protests at Pearl Roundabout in the capital, Manama. Under the ever watchful gaze of the US Fifth Fleet, which is based in Bahrain, the regime – with Saudi support – responded to peaceful protest with sustained violence, leaving around a hundred demonstrators dead and far larger numbers injured. Simultaneously the state moved against organised workers, particularly those associated with the Bahrain Teachers Association (BTA). This democratically organised representative trade union was violently suppressed and its leadership imprisoned. The outrageous treatment of the teachers took place within a wider environment of state intimidation, including mass arrests and torture of trade unionists and civil rights campaigners. All this is well documented by leading human rights organisations, including Amnesty International and Human Rights Watch, though news media coverage has been intermittent and sparse. 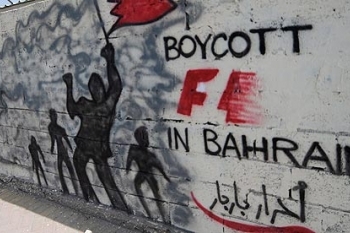 Bahraini human rights activists and trade unionists are seeking support for the campaign to stop Formula 1 as well as the broader, ongoing struggle for reform in the country. Inevitably this takes on an international character, particularly when – as with Bahrain – relationships deeply reminiscent of old style colonialism are present. In Britain, for example, Early Day Motion 1194, tabled on 17th February with MENA Solidarity Steering Group member Labour MP Katy Clark, as primary sponsor, endorses opposition to the staging of the Grand Prix there. One obvious first step, if you are in Britain, is to urge your MP to support and sign the motion, but much more than that is needed. Trade unionists should raise the matter within their branch as well as more widely to disseminate a consciousness of what is happening and contribute to the growth of solidarity-based relationships with Bahraini unions, especially where they have suffered state violence. Such measures, across a range of unions, would prefigure a class response to the repressive and reactionary solidarity between the British state, together with its pampered arms trade and elite miltary training provision, and the Bahrain tyranny. A fuller account of the struggle of the BTA, its context and the need for international class solidarity in defense of its right to exist, written by myself, is posted on the UCU website here. April 2, 2014 in Bahrain, Campaign.